Set your game alight with the Kookaburra Team Dragon! Sorry, couldn’t resist, there may be a few more as we get through this review but rest assured I will bring you all you need to know about the Kookaburra Team Dragon. It’s easy to see when you start to review the Team Dragon that Kookaburra have designed this stick with a purpose, control. Control comes from a combination of the Kookaburra Skillzone, the KCF coating on the face and the really cool Mbow 2 shape. Why have Kookaburra had the Skillzone for 7 years or so and why keep putting it on their top of the range sticks like the Team Dragon? Because it’s bloody good that’s why! Having the Skillzone in the face of the Team Dragon gives a slight indented area which subtly cups the ball. If you haven’t experienced this before it can sound quite weird, the Skillzone is quite subtle, it certainly does its job. Some people don’t like the Kookaburra Skillzone because it does force you to be more accurate with hits, however for the more skilled player the Team Dragon is aimed at, will not have a problem adjusting. The benefit outweighs the change, if you’re good. It’s promoted by some as improving 3D skills, though I don’t think that’s strictly the intention in the Team Dragon, the shaft bow is too high. Control when dribbling is what it’s all about in this stick and that brings me on to review the KCF. KCF (why do they need to call these things such silly names) is the abrasive layer on the face of the stick. Definitely upgraded in the 2015 range, running your fingers across it you get the feeling it could file your nails. Will it last is my only question about KCF? I had a Kookaburra stick with this on previously and it was all gone after a few months. For me the Skillzone is the better feature but KCF is still welcomed and both help with controlling the ball. 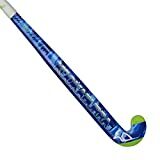 You could not give a review of any Kookaburra hockey stick with the interesting Mbow 2 shape shaft without talking about it. 24.5mm curves we are all used to now, it’s big and pushes the FIH limit of 25mm. It’s the position of the bow in the Mbow2 shape that needs the review. At 380mm up from the heel this shape is different to almost every other hockey stick on the market. It gives a really bent shape to the whole shaft rather than being a kink out of the bottom. For me it certainly takes some getting used to and im yet to really understand what the benefit is. That said, if you prefer a high bow, you can’t get higher than this. To summarise the review, the Team Dragon no doubt deserves its place in the top of the range TEAM models from Kookaburra. With a bow that high I can’t see it working for an attacker, however for player who may defend often and power forward occasionally the combination of a higher bow, tonnes of power and the dribbling control from the Skillzone the Dragon might just roar! If you want the Skillzone (highly recommended) in a lower bow stick, read our Team Phoenix review for the perfect hockey stick. Or get to grips with the whole Kookaburra 2015 hockey stick range on our special article.